To get here simply take Interstate 5. Exit at Sedro Woolley. 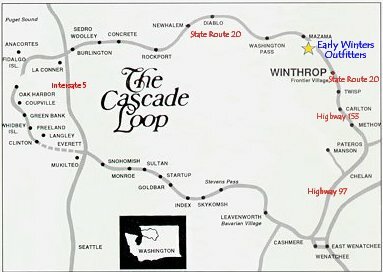 Travel East and follow signs to the North Cascade Scenic Highway (State Route 20). Traveling the North Cascade Highway will bring you directly to Mazama, Washington. We are located on Highway 20 just 1.25 miles past the Mazama turn-off on the right side of the road. If you get confused , just call us at (509) 996-2659 and we'll help you out. If lodging is needed we recommend you phone ahead and we will make all the arrangements. Take Highway 97 to the town of Pateros. At Pateros turn onto Highway 153 and follow this road up the Methow Valley all the way to Winthrop. (This road becomes Highway 20 just south of Twisp). At the 4-way stop sign in Winthrop (the only one in town) turn left. This will keep you on Highway 20 West. Follow Highway 20 West for 13 miles, (just before the turnoff to Mazama). Look for our place on the left side of the Highway. If you get confused , just call us at (509) 996-2659 and we'll help you out. If lodging is needed we recommend you phone ahead and we will make all the arrangements.